On Wednesday, February 24, Facebook began a global roll out of Reactions – an extension of likes. The new feature is designed to increase engagement and tailored to the growing mobile market. The reactions were chosen based on “empathetic reactions” to content to allow users a wider range of expression to a specific piece of content. For nonprofits, the opportunities seem to be favorable. Marketers are excited about the deeper level of engagement expected and the greater opportunity to understand how followers are reacting to specific messages. I.E. Increased engagement can be expected. Other platforms like Twitter saw a spike in activity when more user-friendly reactions were provided on the platform. Twitter’s switch from favorites to likes resulted in a 6 percent spike in engagement. For performance tracking on posts – we now have more to judge and analyze than just likes, hides and unfollows. Now that we have a more detailed way to track reactions, we need to explore how to use that knowledge base in message testing and content creation. Mobile optimization! This feature has been designed specifically for mobile users. This serves as a reminder that content creators will need to be more mindful of how content is displayed on a mobile platform. We don’t yet know how the specific reactions will impact organic reach and ad performance. Facebook has publicly stated that all reactions carry the same weight currently but that will evolve over time. Community managers need to keep a close eye on various reactions on posts to gauge how the audience is responding to a specific message. We may need to create a plan of action on how to respond to stronger reactions like “angry” and “sad”. The range of emotion also means that some people will not “approve” of the work that nonprofits publicize. Trolls could also use the negative reactions to commandeer a conversation. We’ll want to track the negative reactions very closely. Mobile Optimization: Reactions are optimized for mobile in response to a growing shift to mobile users of the social platform. Organic Reach Impacts: There’s been no decision currently on how emotions will take priority in the feed – i.e. “love” will not out-perform “like”. That is to be determined as FB analyzes how users take advantage of the new platform feature. Great Engagement Expected: Reactions are designed to allow users to “express empathy”. For nonprofits – users will have a wider range of ways to express empathy toward a mission or impact story. Twitter saw a 6 percent increase in activity when it switched from “favorites” to “likes”. Giving users more options to react may spark an uptick in engagement on client pages. Community Management Value: Marketers are excited about Reactions because it will give a clearer picture about how fans feel about brand and content. 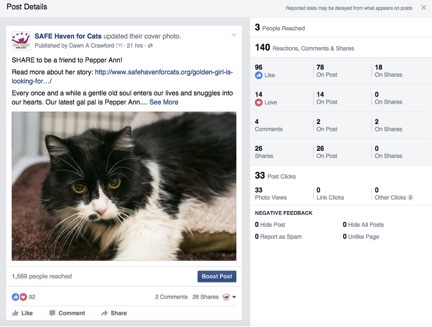 We’ll have a more accurate picture of how content performs – more than likes, comments and shares or the number of hides and unfollows. By taking the time to select a reaction rather than a like, it shows a deeper level of engagement. Greater Community Manager Importance: It will be more important to maintain community manager activities and identify a process for responding to negative reactions to content. But more engaged community management can lead to better supporter service and cultivation overall.